Spotted today through the door of the Red Cross shop and swooped upon like a starving seagull (me) - a set of Cornishware china, none of it matching but in splendidly shiny condition and reminding me of spring. 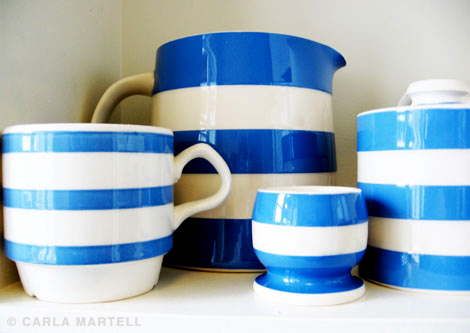 I've collected Cornishware for years, not as a proper collector but picking up pieces one by one, when I've seen them hiding in opshops and markets. It was first produced in England in the 1920s and is still being made, but some pieces are highly sought after, like vintage named jars (the ones made for holding salt, spices and so on). Very rare, for example: Apricots, Borax, Curry, Dripping, Herbs, Lard, Margarine, Marjoram, Pimento Seeds, Table Salt and Washing Soda. You can usually date the pieces from the backstamp, and the set I found today is probably quite young, from around the 1980s. I love the fat little eggcup, and the big jug is now in charge of a basil plant. I was very excited to get it all home and put it in its rightful place!